A premium product with strong worldwide demand. The original natural leather shape. Extra large chamois in sizes 4.50 to 7.00 sq ft. Broadly rectangular in shape with one straight long edge. Straight edges help to create a uniform packaging look. Shape sold widely in the USA. Curved triangular shape with one straight edge, that helps create a uniform packaging look. Trimmed from a ‘Half Skin’ to give two straight edges. Available in medium to large sizes only. Our industry leading and best selling premium shape. Perfectly cut from a template, but priced higher due to wasted material (Consider trimming from a ‘Full Skin'). Sizes up to 4.00 sq ft. Premium shape, perfectly cut from a template. Priced higher due to wasted material. Sizes up to 4.00 sq ft only. Introducing our new Triangle Shape. Perfectly cut from a template for a consistent shape. Highly competitive price point. Small to Medium sizes. A natural shape our best value chamois. Ask us about discounted availability in smaller sizes of 1.00 to 1.75 sq ft.
Sewn chamois pieces. Excellent discount retailer choice or as an entry level chamois in your range. Size 40cm x 40cm. Used to wipe condensation from the inside of a car windscreen. A popular product in many markets. Size 8cm x 12cm x 3cm. Our small sizes brand for chamois 1.00 to 1.75 sq ft. Also a very suitable brand option for Patchwork chamois. 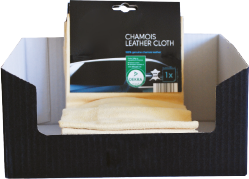 Our established Tanners brand chamois, available in all size and shape options to best suit your individual market. Please contact our sales team for advice and to discuss your needs in more detail. Tanners Car Care brand demister sponge. Used to wipe condensation from the inside of a car windscreen. Size 8cm x 12cm x 3cm in boxes of 28 units. Chamois packaged to your own brand specifications. ‘Top 5’ retailer auditied packaging area. Please contact our sales team to discuss your needs in detail. Bespoke case display units are available. These excellent displays boxes hold 20 units of chamois and 20 demister sponges, for an eye catching retail display. Our established Tanners brand chamois is available in all size and shape options to best suit your individual market. This ‘auto’ focused branding has been successfully carried by a ‘top 5’ global retailer for a number of years. All Tanners Natural Chamois is British Standard approved quality and Deri2000 is a Leather Working Group (LWG) rated and Sedex audited factory. As a buyer you can be assured that not only will you receive a premium quality product, but that it is backed up with industry leading levels of ethical and environmental good practice. Chamois can be packaged to your specifications by our ‘Top 5’ retailer audited packaging department. 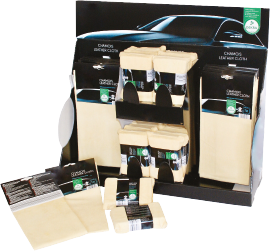 Bespoke case display units are available – this image shows a combination display box containing both natural chamois and chamois demister sponges. 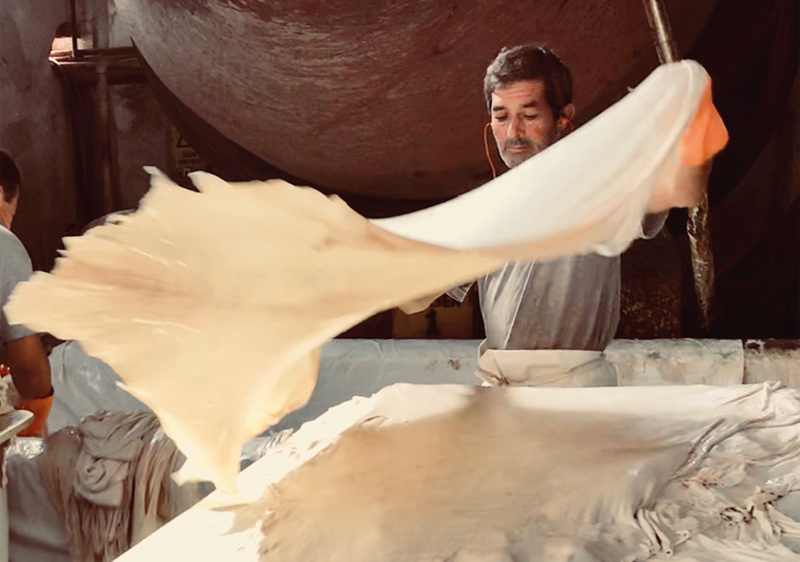 Skiver leathers are produced from the top grain split of a sheepskin. DERI2000 has the ability to fell monger its sheepskins, so we are able to choose from a wider selection of raw material than most of our competitors, so we select the finest European and New Zealand sheepskins for our leathers. Skivers are commonly used for bookbinding and small leather goods. DERI2000 Skivers have an exceptionally clean finish so they are also used in the fashion industry for garments, handbags and shoe uppers. We sell pickled, crust and finished Skiver leathers in all colours. Our standard colours are white, black, beige and brown. Please contact us for more information.